As most stoner / doom / desert bands that aren’t technical or complex like Mastodon and not all out glam like Monster Magnet had for a period, and their ilk, drawing more inspiration from psychedelia, spacerock and more modern doom bands like Cathedral (in particular), Orange Goblin debuted on Cathedral man Lee Dorrian’s “Rise Above” label in the late 90s with the album Frequencies From Planet Ten which was a stellar progressive spacerock debut. I witnessed Orange Goblin, indeed, open for Cathedral at a show at the John Dee venue in Oslo in 1999 where it looked like everyone was bummed out, drunk or on a bad trip! Their second album Time Travelling Blues was more of the organ laden biker stoned blues of the debut as well. 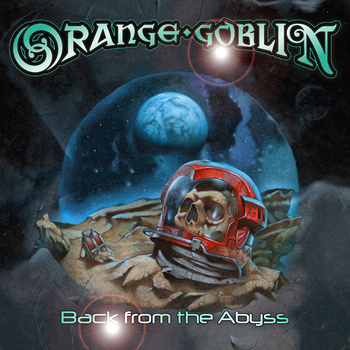 But after that, Orange Goblin was a band that could not hold my attention. They seemed to serve straight up booze life bar metal rock and ditch the psych outs on the 00’s albums, and I only cared for those very first first two CDs, as much as I thought they had success anyway, I just thought “good luck to them hard drinkin’ rockers” rather than wanting to hang with “stoned acid freaks”. Well, the latest album Back From The Abyss manages to hold my attention span for most of the album, as little variation as there is. Songs like Heavy Lies The Crown in particular recalls NWOBHM style symphonic-ness and the opener, Sabbath Hex, could very well be a slow number from a death/grind band like Bolt Thrower in their mid 90s era, to my ears. The 12 tracks on this album are more memorable than anything i heard from this band on the last 3-4 albums, and at least thats good. Maybe it is just my mood but they seem to be tracking a bit more “on the path” as it may be to outer space Goblin enlightenment… well the song Mythical Knives is pretty stonking on its own, with cool inventive and catchy riffs, but I give this album a 7 / 10 because there is little variation from song to song, but its not badly played or anything, the whole thing is just not my kind of regression to alcoholism and bar fights with bikers. I kind of left that scene when I left NJ twenty years ago… on that note it comes recommended to all hard drinking stoners!